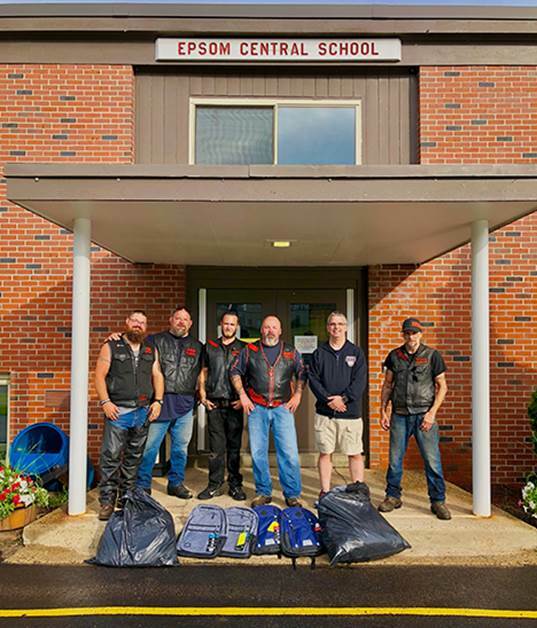 The Granite State Brotherhood Motorcycle Club, from Epsom, New Hampshire is a club that seeks to support the community that accepts us as a neighbor without issue or concern. We donate as often as possible to help provide for the community. Recently, Principal Patrick Connors from the Epsom Central School, was good enough to meet us early Saturday morning to accept our donation of 18 backpacks for the students of Epsom Central School for the upcoming 2018-19 school year. We were happy to meet him and present him with the backpacks. We are very appreciative of him for taking time out of his busy day to accept our donation.